Jim Elzinga, founder of Heroic Hearts, is a world-renowned high-altitude mountaineer. He was a member of two historic Mount Everest expeditions, one of which he organized and led. 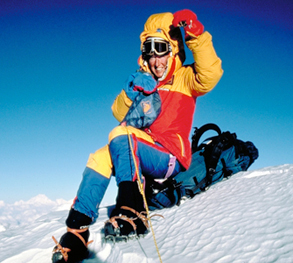 On both climbs Jim faced life-and-death challenges that shaped his understanding of leadership. On Everest leadership didn’t mean worrying about a weak bottom line. It meant getting to the summit safely, making life-and-death decisions and bring his team home alive. Both of Jim Elzinga’s Everest expeditions have become legendary, but they were markedly different in size, style, purpose and result. Even though both expeditions met their prime objectives, one is remembered as a triumph, the other as a tragedy. Both provided many tough, important lessons in leadership. In 1982, Jim joined his first Everest expedition. It was an attempt to put the first Canadian on the summit, and it was a large-scale, well-funded effort. To increase the chances of success, the team took the traditional, well-established route. The team numbered 65, including a legion of local Sherpa’s hauling tons of equipment. The event was launched to great media fanfare. That first expedition succeeded in placing the first Canadian, Laurie Skreslet, on the summit. But success came at a bitter price. On the way, the expedition was marred by the tragic deaths of four men, by deep and rancorous divisions among the members, and by a crisis of leadership. For many of the survivors, the wounds have never healed. The 1986 Everest Light Expedition, led by Jim Elzinga, was different in almost every aspect. The team’s objectives were to establish a new route to the summit. And to do so in pure, minimalist style. The team numbered only 11 climbers, supported by a budget that was a fraction of the 1982 venture. No Sherpa’s were employed, and the climbers carried all their own equipment. The media largely stayed home. This was at true adventure – a climber’s climb. After three grueling months, Jim Elzinga’s team place Sharon Wood and Dwayne Congdon on the summit, establishing a new route for the history books, a feat that has to this day never been repeated, despite seven subsequent attempts. All expedition members returned safely and Sharon Wood achieved celebrity as the first North American woman to summit Everest, an unplanned but welcome bonus. In 1985, the senior management of Continental Bank faced a critical issue. For a variety of reasons, the books predicted a $3 billion shortfall in deposits. If the number wasn't reversed quickly, customer confidence could erode and with it, the viability of the bank. The executive created a task force, called Operation Confidence. They named a young operations officer, John Barratt, as its leader. His mission: motivate all 1500 of the bank's employee to go beyond the call of duty, and quickly repair the bank's deposit base. Soon after, through a friend in Calgary, Barratt learned of Jim Elzinga's Everest mission. Barratt immediately saw the potential affinity with his own mission, and contacted Elzinga. The two men recognized a win-win opportunity: the climbers needed the bank's financial support for, and the bank needed the climber's inspiration. Barratt arranged for Elzinga to present his case to the Continental senior executive. The executive agreed with Barratt, and Continental became the lead sponsor of the Everest Light expedition. Barratt set about implementing a grassroots campaign to introduce the climbers to the bank's employees, creating a single, inseparable campaign. Employee teams were given "impossible" targets to achieve. Then, as the Everest mission progressed, they received regular, inspirational updates from Elzinga on the mountain. Elzinga linked the challenges of the climb with the banks seemingly “impossible challenge.” The strategy paid off. As Elzinga's team climbed up the mountain, the bank climbed out of trouble. During the three months of the Everest climb the bulk of the $3 billion deposit shortfall had been recovered with sufficient momentum to recover the full balance within the next few months. From this success the bank’s management team went on to return to its shareholders in excess of $18 per share, more than double the share price prior the. Bank’s Operation Confidence and the parallel mission of the Everest Light team led by Jim Elzinga. 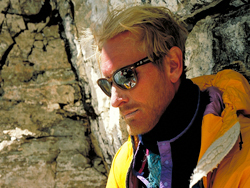 Barratt described the Everest Light campaign as a career-defining experience, saying, "It connected me with hundreds of people at every level of our organization, and opened countless career doors for me." Asked to describe the campaign's most significant leadership lesson, he said, "The unimportance of success. At first I worried what would happen if the climb failed. But I realized, it doesn't matter. Leadership isn't defined by success. It's defined by the effort to succeed." 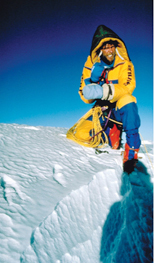 Fortunately, quality leadership resulted in Continental’s success in “climbing back” and Everest Light team’s success of “climbing to the top of the world”. To sail beyond the sunset,. . . The meaning for us is one of continuing to reach for greatness, of always seeking opportunities for exploration and discovery. Our logo is a visual representation of the Heroic Hearts spirit, speaking of Teamwork, Leadership, Solidarity, Synergy, Movement and the Dynamism of the Human Spirit.